This year's Easter production at Covenant Church marries classical and sobering scenes of the Cross and Resurrection with an original musical/comedic script dealing with modern-day, "real-life" situations. In the latter parts of the play, theatre-goers are reminded of WHY Jesus came and died and of the reality of a Final Judgment for all mankind. This nontraditional Easter production is written, directed, and produced by Aaron Williams--the actor/writer/director/producer of the popular "Our Family Christmas" series. As with all of Williams' productions, this play will make you laugh and cry--& leave thinking about all those things in our lives that REALLY matter. 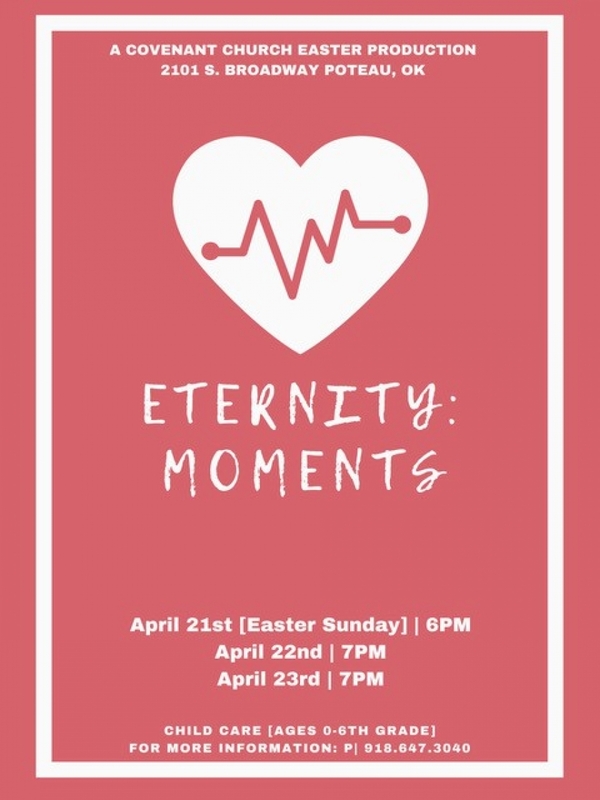 Eternity: Moments, will be performed on Sunday, April 21, at 6 p.m., and on Monday and Tuesday, April 22-23, at 7 p.m., at Covenant Church. Admission is free, child care is provided, and open to the public. For directions or information regarding performances, please call 918-647-3040.